A restaurant that was raided by immigration officers in February has now been ordered not to open for business by environmental health officers. 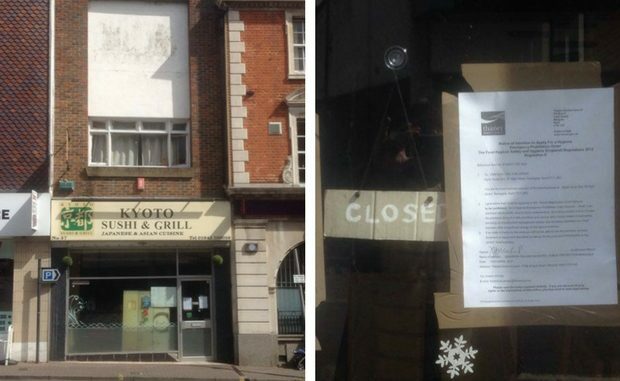 Notices were put on Kyoto Sushi and Grill, in Ramsgate High Street, today (April 13) saying an emergency prohibition order had been acquired from magistrates for a series of failings. The notice says the restaurant has failed to register as a food premises, is in a dirty condition, contained mouldy food and has no documented management. The notice is signed by Thanet council’s public protection manager and sanctioned by the courts. The business is already facing a £60,000 fine after three illegal workers were found working on its premises in February. Immigration enforcement officers found three men had overstayed their visas. They were a 25-year-old Chinese national, a 30-year-old Indian man and a 34-year-old Nigerian. The Chinese man was released and ordered to report to Immigration Enforcement regularly while his case is progressed. The other two were detained pending their removal from the UK. The business was served with a notice warning a fine of up to £20,000 for each illegal worker could be imposed unless the employer can demonstrate that appropriate right-to-work document checks were carried out, such as seeing a passport or Home Office document confirming permission to work.